A big part of doing what I do is traveling by air to the various locations of my clients. Much could be said about working remotely in this kind of industry and whether there is a need for an EHR consultant to actually travel weekly, but my clients apparently like seeing my face, so I abide. In fact, I have traveled so much over the past 5 years that one could say I have reached ‘Expert’ status at air travel. That is why I am making this slight departure in my informatics-related postings, to bring insight into the other half of the consulting world. For a number of us, traveling is a significant chunk of hours during which we are doing something for work, but not getting paid. While I certainly relished having a client in downtown Chicago, which made my air-commute time less than some that drive; being an expert on software that is first described as “Cheap” does not always lead me to clients in geographically close and densely populated areas. There are certain aspects of airlines that I think most people who have ever flown generally agree upon: They’re expensive, they have horrible service, and it’s not a guarantee that they will get you to your destination within a reasonable time frame. The industry itself is known to be as fractured and complex as the healthcare industry is. The parallels are astounding: The wage difference between the bottom earners who are the face to the consumers and the top executives differs by a factor in the hundreds, by most measures the quality of service has been decreasing over the years while the price has increased, and the complexities within the logistics to produce a service have led to some of the most intentionally opaque processes and pricing that consumers have ever seen. Therefore, Late-arriving aircraft delays could be caused by previous Air Carrier delays or NAS delays. 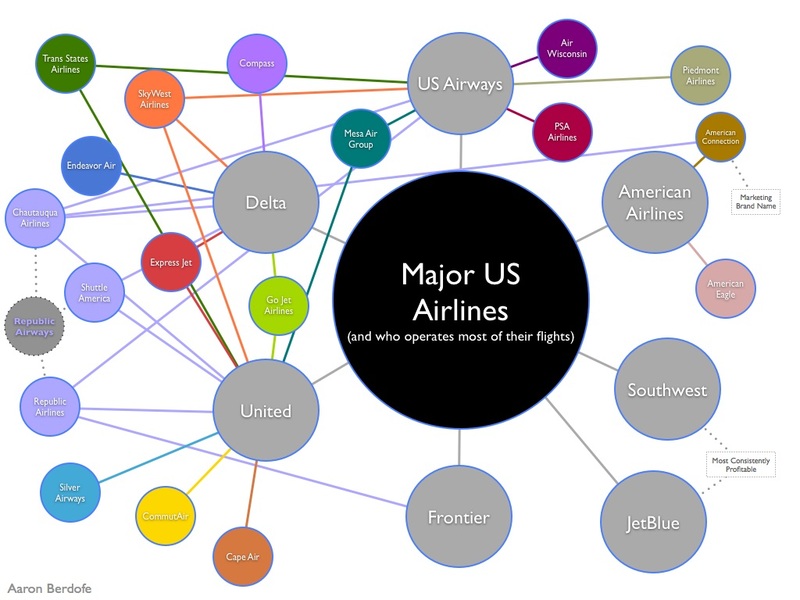 However, a simple graph paints a pretty damning picture of the air carriers. Is it odd that the sharpest period of decline in NAS delays was in the same period of the sharpest incline of Aircraft Arriving Late delays? If you poke around on that site a little, you’ll notice that there are a number of airlines that most people have never heard of. Remarkably though, there is a high chance that those same people have actually flown on one of these regional airlines. What major carriers like Delta, United, US Airways, etc. try not to tell you (but are legally obligated to do so) is that usually over half of the flights flown under their banner are operated by Regional Carriers like SkyWest, Chautauqua, Mesa, etc. Same paint on the tail of the plane, same uniforms, same booking website, but technically a different airline. So what’s different? Less stringent pilot training requirements, smaller cabin sizes, smaller seat sizes, different safety requirements. Oh, and the major carriers don’t include these regional carriers in their on-time flight statistics. And why would they? They are much worse. This means that a carrier like Delta, or United will take full responsibility for booking the flight and taking your money, but none of the responsibility when something goes wrong with that flight. Maybe they’ll throw you some airline miles though. Because I couldn’t resist, here’s a visualization of which regional carriers fly under which major carriers’ flags. All data was sourced from the airlines themselves.